Our wedding colors are navy blue and cream, so use your imagination and insert those colors into these cakes. Happy voting! I like Cake #6 because both our blog and our registry website have a paisley theme. I think it'd be kinda cool to carry that idea over into the cake. 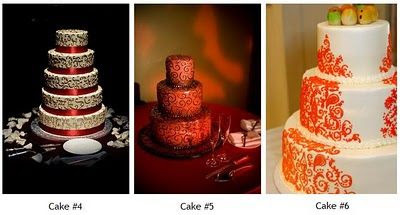 If you could get Cake #2 to have the paisley design that Cake #6 has, I'd honestly like that. So, to make my word official: #2 if the design is possible. If not, then #6. 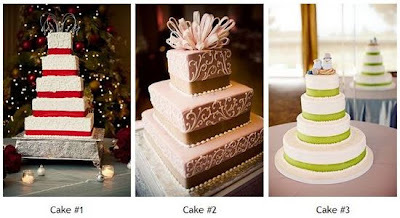 Wil and I talked about it and we like Bobby's idea of incorporating the paisley design from Cake #6 onto Cake #2. Picture it: Where there's brown, navy blue. Where there's mauve, cream/tan. White paisley. What do y'all think about that? I like the same cakes as Bobby #2 and #6. His idea is really good too. Ok, so you know my vote, but to make it official I will post it - I absolutely love #2...I think Bobby's idea is great.